To witness the natural and architectural treasure troves of south India, one of the most exciting and luxurious alternative is to travel on board Golden Chariot train. The modern refinement and traditional ways of hospitality has earned Golden Chariot various accolades including the recognition as one of the seven best luxury rail journeys in the world by Vanity Fair Magazine within 4 years of its inception. A joint venture between Karnataka State Tourism and Development Corporation (KSTDC) and the Indian Railways, the Golden Chariot derives its name from the famous stone. 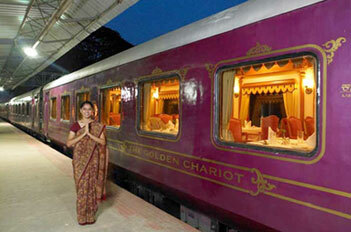 Golden Chariots in Hampi which is also one of the destinations covered by this Indian luxury train. 2 tastefully crafted itineraries of this luxury tourist train - namely Pride of the South and Splendor of the South - unravels the mystifying hues of southern region of India. Whereas Pride of the South traverse the course of Karnataka by covering destinations like Bangalore, Kabini, Bandipur, Mysore, Hassan, Hampi and Badami, the Splendor of the South itinerary covers temple towns of Tamil Nadu and backwaters of Kerala along with destinations in Karnataka. The inside look of this luxury train is a fine juxtaposition of customary and contemporary motifs to retain the old world charm without compromising on the modern comforts. Coaches of this deluxe train are suffused with quaint charm evident in the rich furnishings and antique furniture which is inspired from the cultural ethos of erstwhile south Indian dynasties. To maintain the royal élan of the train journey, all the coaches have been named after erstwhile princely states of the south namely Kadamba, Hoyasala, Rastrakota, Ganga, Chalukya, Bhahamani, Adilshahi, Sangama, Shathavashna, Yudukula and Vijayanagar. There are a total of 26 twin bed cabins, 17 double bed cabins and 1 cabin for the physically challenged. All the cabins of Golden Chariot are outfitted with facilities like LCD television, air conditioning, Wi-Fi internet and a private bathroom to provide cozy comforts to the guests. Other facilities and services provided on board include two ornately designed restaurants, lounge bar, business center, gymnasium and a wellness spa. An array of gourmet delicacies are tastefully served in the lavish premises of the two in-house restaurants whose motifs characterize a mythical character and a Sanskrit word called Nala and Ruchi respectively. There is a lounge bar called 'Madira' where guests can unwind and interact with fellow travelers over a glass of wine. This is not the end of the road for the Golden Chariot facilities. 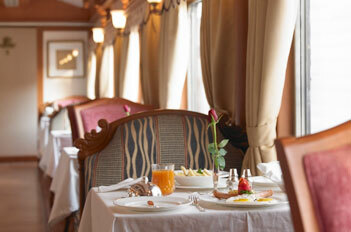 Guests can also partake in few recreational amenities housed within this luxury tourist train. A fully equipped gymnasium and an Ayurvedic spa 'Nirvana' allows guests to tab on their fitness routine even while vacationing. There is a business center for those guests who cannot make out time for holidays out of their hectic business schedule. 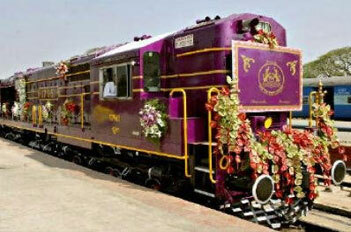 Nothing can beat the romanticism of the royal train tour on The Golden Chariot, India's first luxury train. The history of The Golden Chariot is as interesting and fascinating as its journey itself. The coaches of the The Golden Chariot derive their names from the princely states of India and so does the motiff of decor. There are 4 twin bedded chambers in each coach and is soaked in the ethnic decor. The The Golden Chariot features state-of-the-art amenities and en-suite facilities. Each guest carriage is a replica of an original private salon of erstwhile Maharajas, Nizams and Viceroys of India.